When Website Review originally launched launched as a University of M.U.S.C.L.E. feature there were literally only a handful of well-known M.U.S.C.L.E. websites. 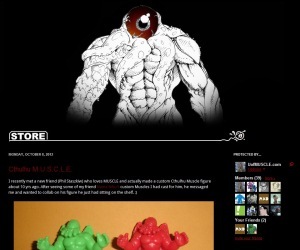 Website Review attempted to showcase some of potentially overlooked M.U.S.C.L.E.-related websites. However, the websites quickly ran out and the reviews shifted to M.U.S.C.L.E.-centric YouTube videos and blog entries. On July 15th, 2010 the last Website Review was posted. Since then many more M.U.S.C.L.E. 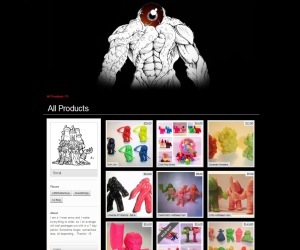 and little figure-related blogs and websites have sprung up. Some of the well-known and some flying a bit under the radar. 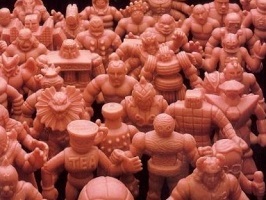 Website Review has returned to help M.U.S.C.L.E. collectors discover (or re-discover) great content – and occasionally some not-so-great content too. The first blog to be “reviewed” is from Eric Nilla – Ericnilla.blogspot.com. It would be foolish to start with anything besides Eric’s work. Being able to witness all of Eric’s stunning work (drawing, casting, sculpting, etc. ), across many different lines of figures, in one place can’t be understated. Not only are visitors treated to the projects that Eric is working on, visitors get to take a peek at Eric’s collection. His passion for all things keshi is immediately evident. While this is nice for casual readers impressionable collectors could end up adding several different lines to their own personal collections. This approach helps to ensure collectors get figures that they like, and not just something-no-one-else-can-have. That’s probably not true, but content is important. Eric’s blog doesn’t need daily posts, but a little more regularity would be nice. He came flying out of the gate in July with nine different posts, but then August had four and September had three. It would be nice to know that every Monday (or someday) Eric will be posting new content. There is a certain excitement when a fully realized product is finally revealed. However, there can be just as much excitement with an ongoing behind the scenes preview. This is an admittedly higher risk situation as collectors can be too quick to unfairly make up their minds. It may be more prudent to offer behind the scenes glimpses to already popular figures undergoing changes (e.g., untrimmed GITD Chibi Poo Shines). Eric does not need to reveal his secret rubber formula, but it would be fascinating to hear his experiences, learnings, and suggestions. Possible topics could range from specific products to technical reviews of figures (e.g., Here’s why this would be difficult to cast…) and from tips on casting and sculpting to interesting keshi auctions (because Eric is a bit of a keshi expert). Eric’s blog, and especially his store, are superb examples of a custom figure artist being able to easily connect with his fans and customers. Given Eric’s artistic ability and relative novice level of blogging it will be fascinating to watch the blog and store evolve. Make sure to join Eric Nilla for the exciting evolution. If more Eric Nilla is needed, then Eric can also be found on Facebook. This entry was posted on Wednesday, October 10th, 2012 and is filed under Art, UofM News. You can follow any responses to this entry through RSS 2.0. You can skip to the end and leave a response. Pinging is currently not allowed.